At Sunken Meadow Auto Collision and Repair, a Certified First Shop, our objective is to satisfy customers by assisting them with the claims process, restoring their vehicle to pre-loss condition, and doing so in an accurate timely manner. With the PPG Lifetime Limited Paint Performance Guarantee, it assures that all refinish products used to repair you vehicle feature state-of-the-art technology and will perform to optimum standards for as long as you own the vehicle. 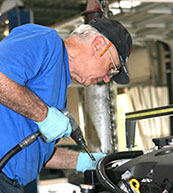 CARCO is the leading provider of vehicle inspection services in the US. We provide this service free of charge. We are certified with ASE, the leading organization providing certification to professionals and shops in the automotive repair and service industry. We are certified with MACS, the leading non-profit trade association for total vehicle climate and thermal management. We are trained and certified with I-Car, the international not-for-profit organization dedicated to providing the information, knowledge and skills required to perform complete, safe and quality repairs. We are expertly trained in the full line of Chief collision repair products, the leader in the collision industry.